What is Odor Eaters Antibacterial Foot and Speaker Spray Powder? 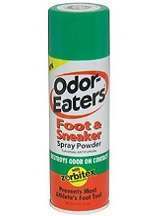 This is our review of the Odor Eaters Antibacterial Foot and Sneaker Spray Powder which claims to be an effective treatment for foot odor. It also has some health benefits when it comes to anti-fungal treatment and prevention. How effective and safe is this product? To learn more, please continue reading our review. This anti-bacterial foot and shoe spray contains some well-known compounds that are often used in eliminating bacteria as well as preventing fungi from developing. It contains the following ingredients that are proven effective in removing odor as well as stopping excessive sweating. You can use the Odor Eaters Antibacterial Foot and Sneaker Spray Powder liberally after a bath or anytime as long as you first wash your feet first. You can apply the powder spray to your feet as well as the interior of your shoes. Make sure to also apply the solution between the toes. For optimum results, spray it a couple of times inside the socks as well. Each can of this foot and shoe powder spray contains about 4 oz. of the solution and will cost about $26.72. There are no known discounts available at this time and the manufacturers do not state any monthly supply packages for those looking to use this product continuously. This is an unfortunate downside as it will most likely be more expensive in the long run than other similar products that does offer some sort of discounts in one form or another. While it is relatively safe to use, proper precautions should always be taken before trying out any new product. Not all skins are created equal and what may be effective for some may not yield the same results for the others. That being said if you experience any form of skin irritation upon contact with the solution immediately stop use and contact your doctor. At the moment, we could not find any sort of guarantees for this product from the manufacturers. This could be an issue for some if they found out they have some allergic reaction to this product. Returns and refunds are non-existent but you can always check with the local pharmacy that you purchased this in to find out if they offer refunds. Odor Eaters Antibacterial Foot and Sneaker Spray Powder do have a solid reputation as it has some solid reviews that you can find online. However, you will also find that it is significantly more expensive than most foot and shoe sprays. Its effectiveness is also a bit shaky in regards to several customers claiming that it barely gave any positive results even after a month of use. As a result, we would advise you keep looking for other athlete’s foot treatment products.